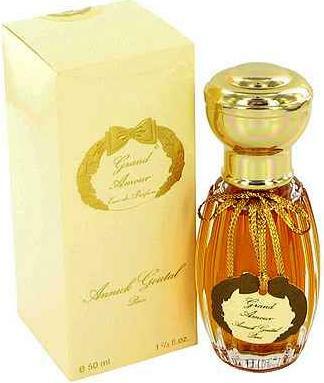 Annick Goutal - Grand Amour (W) ? Illatcsalád: Orientális- virágos ? Megjelenés éve: 1996 ? Illatösszetétel: Liliom, Jácint, Törökrózsa, Árvaleányhaj, Jázmin, Indián mimóza, Ámbra, Vanília, Mirha, Pézsma, Bőr ? Töménység: Eau de Toilette Spray (EdT) ? Leírás: Sensual, feminine, sophisticated ? This intriguing, captivating scent unfolds with each passing hour. A perfect balance of carnal flowers, lily, hyacinth, honeysuckle. A hymn of sensuality with notes of amber, musk, myrtle. A perfume of rare subtlety. ? Grand Amour is the fragrance of peaceful passion. It was born of Annick Goutal's desire to create a fragrance for herself, a fragrance that resembles her, accompanies her and speaks of love, because "love is everything." ? Parfume description: - Floral accord: Lily, honeysuckle, and hyacinth lead a bouquet of other flowers such as Turkish rose, Grasse jasmine, Indian mimosa, broom, heather as well as a few fruity notes. - Ambery accord: The fruity notes flow over a blend of amber, vanilla, myrrh and rare balms. - Musk accord: Intense sensuality with the carnal fragrance of musk, which blooms with the heat of the body as the hours go by.